If you register for the Retreat between now and January 15th, 2015, I will reduce the registration fee to $100.00 instead of $125.00. Registration fee covers the Welcome Reception, 24 hour art room, Saturday afternoon treats, and all classes/demonstrations on Saturday! A STEAL ANY WAY YOU LOOK AT IT!!! 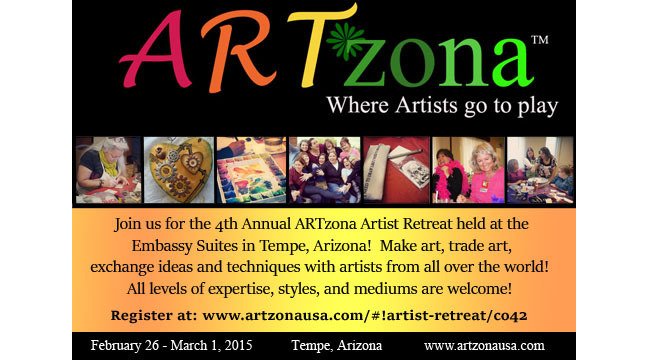 So after much consideration, I have decided that the 2015 ARTzona Artist Retreat scheduled for next month, will be the LAST ARTzona Artist Retreat! At least for a few years. It takes an immense amount of time, effort, and financial responsibility to host this event each year. An event that does not generate ANY money for ARTzona or myself. If anything, it costs me money to host. I do it because I love being surrounded by the amazing group of artists that come each year from all over the globe. I do it because it seems to be the highlight of the year for many who attend. I do it because it is a ton of fun to be in the presence of so many talented and friendly artists. I always look forward to spending time with old friends and making new friends at each event. It’s 10 months of work, for 4 days of fun, and the retreat seems to go by far too quickly every year. But I need a break from the retreats. I want to take ARTzona in a direction that will promote developing artistic skills for artists of all ages and skill levels. I want to start the figure drawing classes again, and start offering BYOB classes and offer various classes to adults and kids again. And canceling the annual retreat for a while will allow time to pursue these other endeavors. I want to thank everyone who has ever attended an ARTzona Retreat, and thank all those people that have helped make it a huge success each year. And I especially want to thank all of our amazing sponsors who have donated such great art supplies for goodie bags, classes, and door prizes! Their generosity makes it even that much more exciting and fun to be apart of ARTzona. I look forward to seeing everyone in February. Bittersweet as it may be.